Shaun Rankin's individual cheese soufflés are twice cooked, allowing you to do the main part of the preparation well ahead of time. The soufflés are firstly steamed – you can then refrigerate them and bake them in the oven just before sitting down with guests. 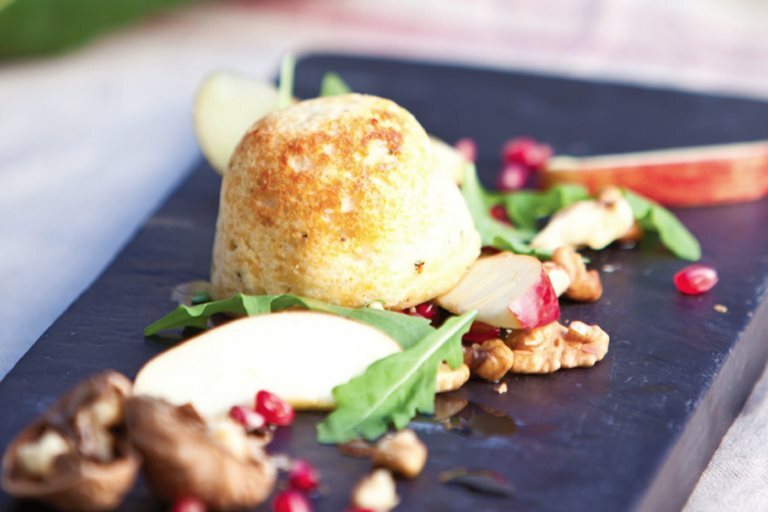 The apple, walnut and pomegranate salad is a wonderful side in this cheese soufflé recipe, but would be beautiful on its own too. If you are making these cheese soufflés for vegetarians, substitute the Parmesan for a cheese with vegetarian rennet, such as Old Winchester. Remove the soufflés from the moulds. At this stage, you can either put them in the fridge until needed or cook straight away.